There will be a whitewater release from Savage River Dam this Sunday (July 1). The release will be from 9 AM until 3 PM with a release rate of about 1000 cfs. We will begin increasing flow at about 7 AM and, at the end of the event, we will reduce the flow to about 55 cfs by 5 PM. There will also be a slight increase in flows (about 175 cfs) on Thursday from 10 AM until 1 PM to aid the sponsor in identifying any potential hazards in the river so that they can be removed prior to the event on Sunday. This entry was posted in news on June 28, 2012 by Theaux Le Gardeur. Backwater Angler T-Shirts in Stock-Free Shipping on 2 or more! Backwater Angler has just received a shipment of pre-shrunk, 100% cotton, T-Shirts. The short and long sleeved T-shirts feature a vibrant screen print high across the back, and the Backwater Angler logo printed on the right front chest. Shirts are available in sizes medium through XL and are limited in quantity. Short sleeved shirts are $23 and long sleeved shirts are $26. We’ll ship 2 or more shirts to your address (or anyone else’s for that matter) priority mail for free. Just give us a call at 410-357-9557. If you’re in the area, stop by the shop and try one or more on…It’s hot out there and just about time for a fresh shirt to get you through the summer. The Gunpowder River is flowing at 76 Cfs, is 51 to 55 F throughout the catch and release section and is clear. Sulphurs are still a good bet midday. We have a new cripple and emerger patterns in the muffin tins. The river has dropped in level which makes it easy for some-as long as one fishes long, light and small –and harder for others-especially if one likes the idea of wading hip deep to cool off. The lower river still has a good many hatchery rainbows that will take streamers with abandon in the pools behind log Jams. For early risers, tricos are just starting at Masemore RD. Al’s trico, as tied by Mike Bachkosky is a great pattern for anyone fishing with cheaters because it is reverse hackled through the bend of the hook instead of behind the eye. The profile of the fly is heavily hackled so that it skates and skitters and they are best fished on 6 or 7x. Thanks to Michael for joining me on the stream this week. The wild fish pictured above and released during the trip was beautiful! This entry was posted in fishing report on June 22, 2012 by Theaux Le Gardeur. The Gunpowder River is flowing at 102 CFs, is clear and 52 F. Sulphurs are now closer to the #16 range. Now is a good time to try a beetle midday with a sulphur emerger tied just behind it. 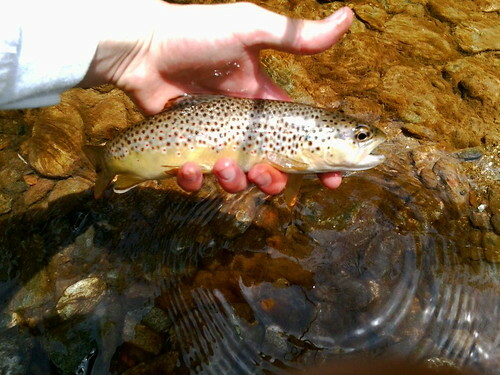 Small dark streamers have been working throughout the morning-especially in the boulder pools. Tricos are just starting in the flats below Masemore and we still have some great dry fly fishing ahead of us this season. A new shipment just arrived from Mary K Jenkins and we have both Brook and Brown Trout long and short sleeved fish t-shirts available in time for Father’s day. This entry was posted in fishing report on June 15, 2012 by Theaux Le Gardeur. 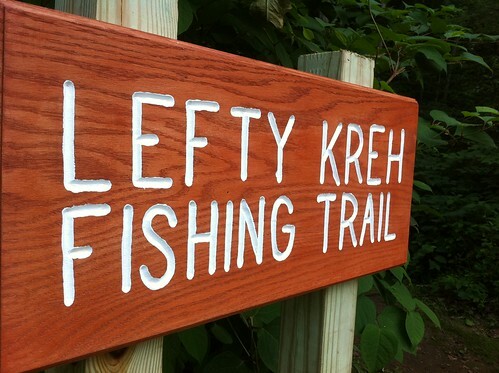 The Lefty Kreh Fishing Trail in the Hereford area of Gunpowder State Park, Maryland will be dedicated June 11, 2012 to Bernard “Lefty” Kreh. The trail markers are located at the Masemore Rd. parking access along the 7.2 mile Catch and Release section and are a fine tribute to this fly fishing pioneer and legend. Lefty will be present and honored at a ceremony with Governor Martin O’Malley and Natural Resources Secretary John Griffin beginning at 12:30 PM. 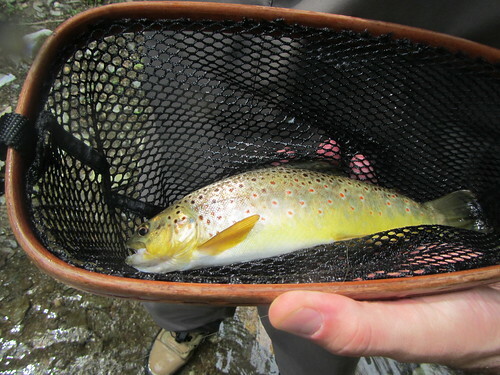 The Gunpowder River’s Catch and Release host to a wild, stream-bred population of Brown Trout. 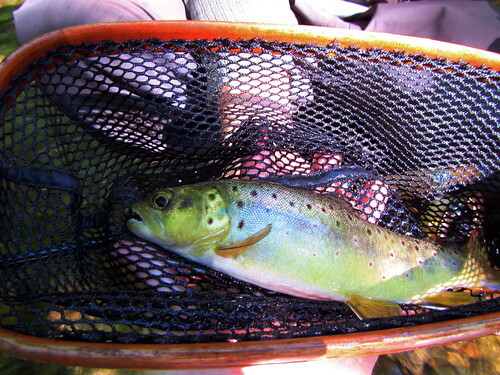 Consistent Coldwater releases from Prettyboy Reservoir create an cold water habitat that has landed the Big Gunpowder Falls River in Field and Streams Top 5 U.S. Tailwaters and Trout Unlimited’s 100 best Trout Streams List. Event Time: 12:30 p.m., June 11. Location: Gunpowder Falls State Park, Hereford Area – Masemore Road Bridge. I-83N exit 31 Middletown Road. Left at the light at the end of the exit ramp. The lot is over the bridge on your right. DNR will have two shuttle vans running to/from the Park N’ Ride to the event. This entry was posted in news on June 10, 2012 by Theaux Le Gardeur. The Gunpowder River is flowing at 108 CFS, is 53.5 F and is clear. The Sulphur hatch has been a bit off since last weekend’s flood and the river has been stabilizing in temperature and flow all week. Solid reports of spinner falls starting as late as 8:00 PM are coming in. One Gunpowder regular, on his way up to Penns this morning, reported that he released a 16″ plus rainbow above Falls Rd. Sulphur duns, including Snowshoe rabbit patterns and traditional feather winged duns sized #16-18, have been working midday. For fishing between hatches or in this case between the hatch and the spinner fall, bead head wooly buggers in the #8 range have been working fine in and around the woody debris. Mornings have been more productive with size #14-16 pheasant tail nymphs. Bright days have been tough this week-think of Browns as hung-over humans and you’ll have the right frame of reference. No Noise, no bright lights, food only when it’s close by…Clouds rolling in most afternoons have been welcome if only for the shade and cover they provide. last week and picked up a few partridge and orange soft hackles on the way out. This week, I felt very fortunate to spend a great couple of hours afield with a new angler from Texas this week. We spent time fishing sulphur duns and streamers in the boulder pools where we were mobbed by a trio of Great Blue Herons and finished up nymphing the powerline riffle the next bright, brisk morning. His first fly caught fish was a chunky wild Gunpowder Brown that fell for a pheasant tail from the muffin tins. It all happened very quickly and began with a smart roll cast, a perfect drift, when…the indicator stopped, then moved left, the line tightened and the light rod doubled over-it was a fish that did not come easily to the net. He released the fish with equal grace and is well on his way to becoming a fine fly fisherman who is always welcome to stop up for a little R&R. This entry was posted in fishing report on June 7, 2012 by Theaux Le Gardeur. 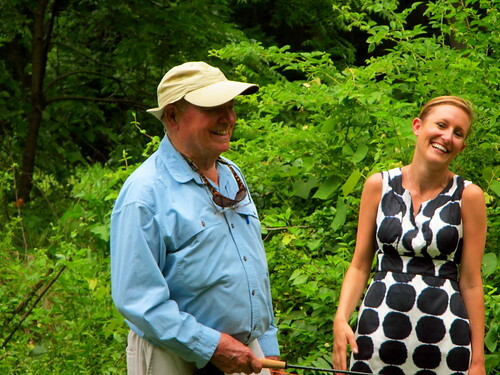 Please join us for a fly fishing school! On Sunday, June 10, a Backwater Angler Guide will be teaching a fly fishing school that is ideal for beginners. 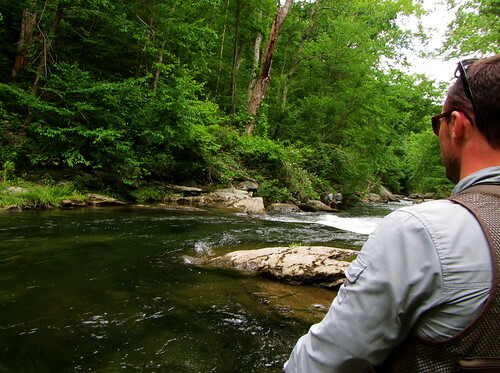 If you’re planning on flyfishing Maryland, or anywhere else for that matter, this course is a great introduction to the sport. The school covers knots, casting, gear and fly selection. Class is held from 3:00 PM till 6:00 PM. Cost is $100 per person and includes the use of gear. A Maryland non-tidal fishing license and trout stamp is required and may be purchased at the shop with check or cash the day of the school. Class size is limited to 4 and pre-registration is required. Please give us a call at 410-357-9557 or drop us a line at info@backwaterangler.com to pre-register. This entry was posted in events on June 7, 2012 by Theaux Le Gardeur. 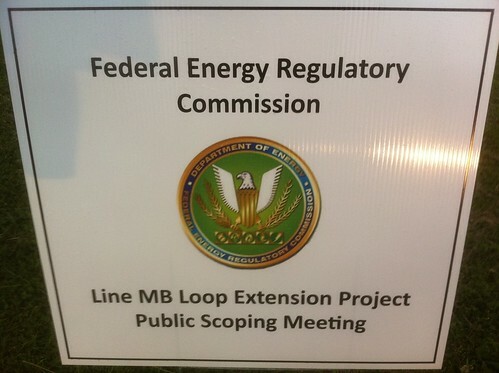 The Columbia MB line FERC meeting was, shall we say, uninfomative. As an excerpt from the Gunpowder RIVERKEEPER Twitter feed from May 9 will demonstrate. 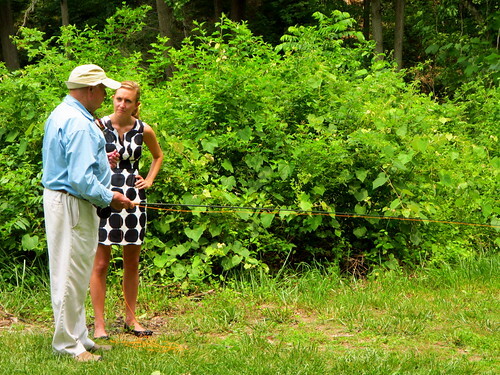 Residents of the Fallston area seemed to know more about the proposed MB line than FERC representatives. Surprisingly, neither FERC nor Columbia represenatives were able to confirm whether there has been any communication or coordination between Baltimore City on the proposed MB line. The City is charged with providing drinking water with 1.7 million metro area residents and should be notified regarding the environmental scope of the project. One of the FERC representatives, when questioned about how the line would impact Rural Legacy and Agricultural Easements to her credit mentioned that she had only, just, last week become aware of the different types land trust easements in the area. I met with a Columbia representative a few days after the meeting to view a detailed map of all of the water crossings of the proposed MB line. Unfortunately, that map presented was not sufficient in detail to gauge potential impacts to rivers, streams, wetlands and ponds in the Gunpowder Watershed. Most questions posed at the meeting were answered with a blanket statement that; “FERC is still gathering information and awaiting resource assessment information from Columbia and it will soon be posted on our website. The FERC website, now populated with some information from Columbia features a file marked “privileged” that is, of this writing, not accessible to the public at large. We are not at all persuaded that this project is necessary. Even assuming that a line is necessary, we believe that any line should be built with minimal impact on the environment and the community. In addition, we believe that to date, the process followed by Columbia Gas has, at best, met a minimal standard of transparency…Because FERC is a federal agency, we recommend contacting your federal officials. Please contact Congressman John Sarbanes (202-225-4016), Dutch Ruppersberger (202-225-3061), Elijah Cummings (202-225-4741), or Andy Harris (202-225-5311), depending on where you live. And also contact U.S. Senators Ben Cardin (202-224-4524) and Barbara Mikulski (202-224-4654). From the Patch:Zirkin Testifies against Columbia Gas Line Proposal:The senator protested the project at a public hearing before the Federal Energy Regulatory Commission at Oregon Ridge Lodge. This entry was posted in news on June 7, 2012 by Theaux Le Gardeur. On Memorial day, Gunpowder River levels level plumetted as fire and police units responded and rescued a man at Prettyboy Dam. ABC2 News covered the helicopter rescue with a short video and the Cockeysville Patch followed up with an article titled Middle River Man Rescued from Prettyboy Dam which stated that the man was charged with criminal trespassing.